Learning to recognize and write the alphabet, as well as learning the letter sounds, are foundational to early literacy. For many children, a multi-sensory approach is necessary to help cement the letters and their sounds into their minds. Here are some fun ideas for teaching the alphabet. Quite possibly one of my daughter’s favorite alphabet activities is to use colored sand to practice writing the alphabet. For sand writing, simply pour enough colored sand into an 8 x 8 baking dish to cover the bottom. Alternatively, you can use a craft tray, but I’ve found that the higher sides of the baking dish keep the sand from going all over my floor. Once the sand tray is ready, either call out letters or give your child a shuffled deck of alphabet cards and let them practice duplicating the letters by writing in the sand with their finger. You can also use salt or sugar for this activity. For the child that would rather build things, the letter construction kit is a must. This is a colorful visual way of teaching little ones how to build the upper and lowercase letters. The pieces snap together to form the letter that they are working on (fair warning – the pieces are snapped together when you open them, and may be difficult to separate the first time – or it could just be me). Most children love paint daubers, so do-a-dot alphabet printables are a great way to help them learn to recognize letters. Print the whole set or just the letter you’re working on for the week. Both sets, the lowercase do a dot alphabet printables and uppercase do a dot alphabet printables, are free! Children love using play dough. Give them a set of alphabet cookie cutters and a set of Play Doh for hours and hours of alphabet fun! Speaking of play dough… another sure win is alphabet play dough mats. My daughter uses these and absolutely LOVES them! There’s just something about rolling and shaping play dough into letters that brings a smile to her face. A simple search on Pinterest will yield a score of options for these fun printables. You’re sure to find a themed one your child will love. Pro Tip – Don’t want to laminate 26 pages of play dough mats? Dry erase pockets are a great alternative! Give your kiddo a stack of scribble paper and a set of finger paints and let them finger paint their letters. This fun multi-sensory activity can be a lot of fun. A fun alternative is to use pudding as the finger paint, for those who like to snack while they work. Grab the shaving cream and let your child write the alphabet in the “snow”. You could also use whipped cream for this activity, if your little one is prone to putting their fingers in their mouth. We use craft trays for these activities, because they wash so easily! Get outdoors with a tub of sidewalk chalk and create an alphabet hopscotch board for your kiddo. As they roll their rock onto a letter, have them say the name and sound of the letter before hopping to it. Alphabet stamps are super fun and kids will enjoy using them to practice their abc’s, 123’s, and even spelling out their name and sight words. Kids love to play with their food. For spaghetti letters, all you need are a box of spaghetti noodles and some alphabet cards. Boil the spaghetti noodles, then cool them by running cold water over them. Place a bowl of noodles on a craft tray, and encourage your kiddo to build letters using the noodles. A great way to teach letter sounds is with alphabet crafts. These free alphabet craft printables have a craft per letter that is sure to make your little one smile! Have your child practice writing different letters in the air using their finger as a pencil. Provide your child with a whiteboard and dry erase marker. Tell them you’re going to call out a letter and you want them to write it as large as they can on the board. Grab a plastic shoe box and fill it with rice or beans. Add a set of wooden letters or magnetic letters and mix it all up. Have your child find the letters and say the letter sound as they find them. When all of the letters have been found, have your child place them in alphabetical order. Have your child look for different objects that start with a certain letter. For each item they find, they state the name of the letter and the sound it makes. Take your scavenger hunt outside into nature. This one is fun with siblings. Some children love worksheets. These alphabet writing practice printables are ideal for them. Learning the alphabet is just one of the skills necessary for early literacy. Check out this post to see 5 Things Your Homeschool Child Should Do Before Learning to Read. These are just a few fun ideas for teaching the alphabet, and there are so many more. 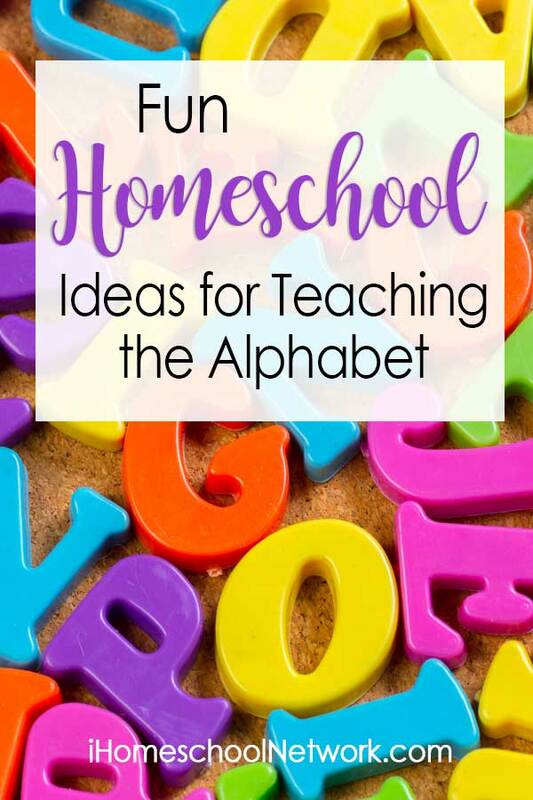 Be sure to comment and tell me your fun ideas for teaching the alphabet to the kiddos in your life!